Helloooo people! Nice to see you all after a long long time. Hope you guys didn’t forget me. Where have I been? A combination of personal issues, laziness, and technical issues that have resulted in this blogging lapse. I am so sorry i couldn’t keep my word last time and post regularly. This time i am not promising anything, but i will definitely try to post more regularly. I swear! With the Holy month of Ramadan upon us, we, like many other Muslims around the world, have already begun preparations in our homes. During Ramadan, Muslims are obliged to fast during daylight hours from sunrise to sunset. 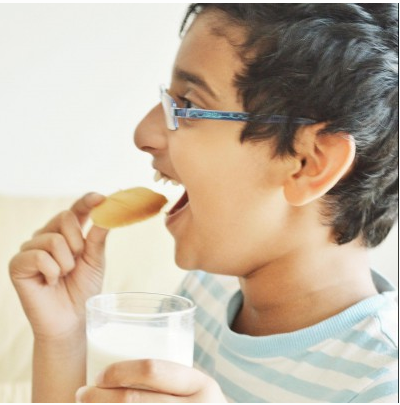 This year, Ramadan has arrived in the peak of summer, meaning the days are going to be longer and much hotter than many of us are accustomed to. But regardless, Muslims all around the world have looked forward to this blessed month all year long in anticipation of the spiritual benefits…as well as the delicious, and plentiful meals that bring family and friends together. There are usually two meals every day during Ramadan, one before the fast commences (known as Suhoor) and another to break the fast at sunset (known as Iftar/futoor). 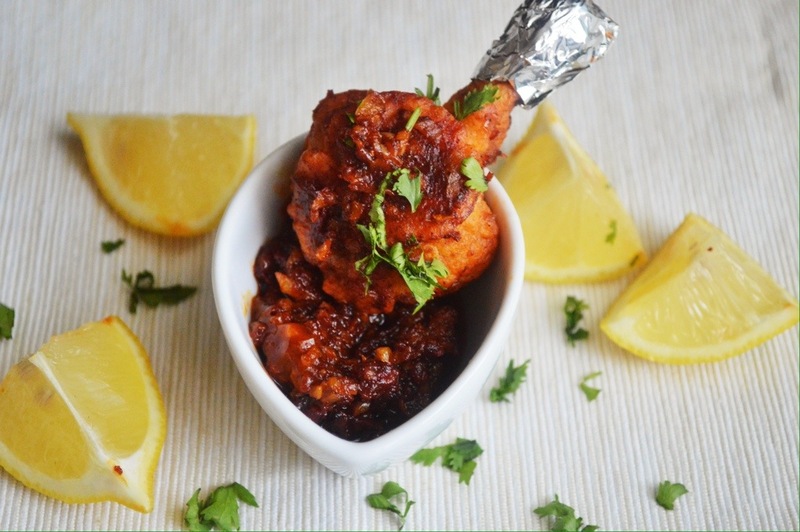 Usually in most households, there will be iftar parties, where family and friends gather. I am sure most of you are prepping yourself for an Iftar party. 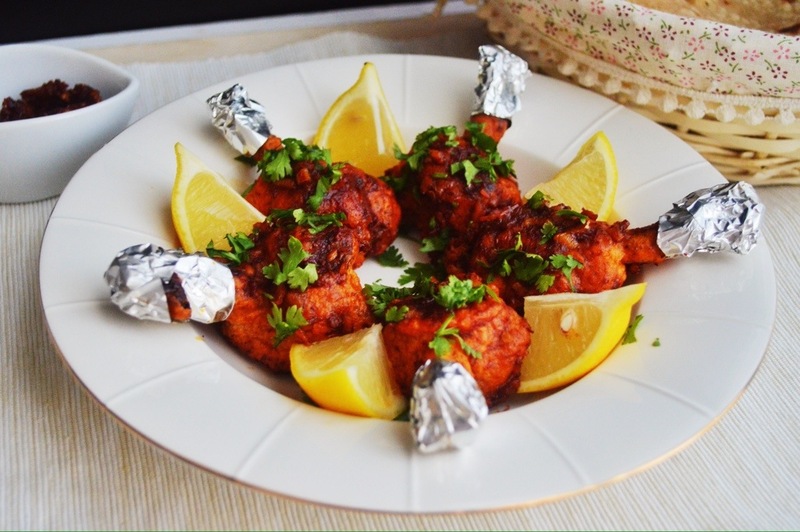 If you’ve got your samosas, pizzas and kebab ready to entertain, but are still looking for that perfect appetizer that will appeal to all your guests, then you have definitely got to try this Chicken Lollipop recipe. 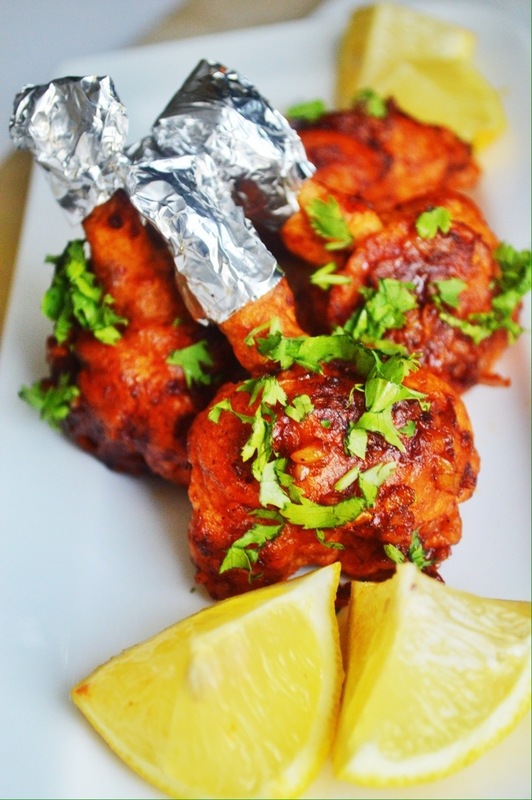 Bite-size finger foods are always a hit at any gathering. 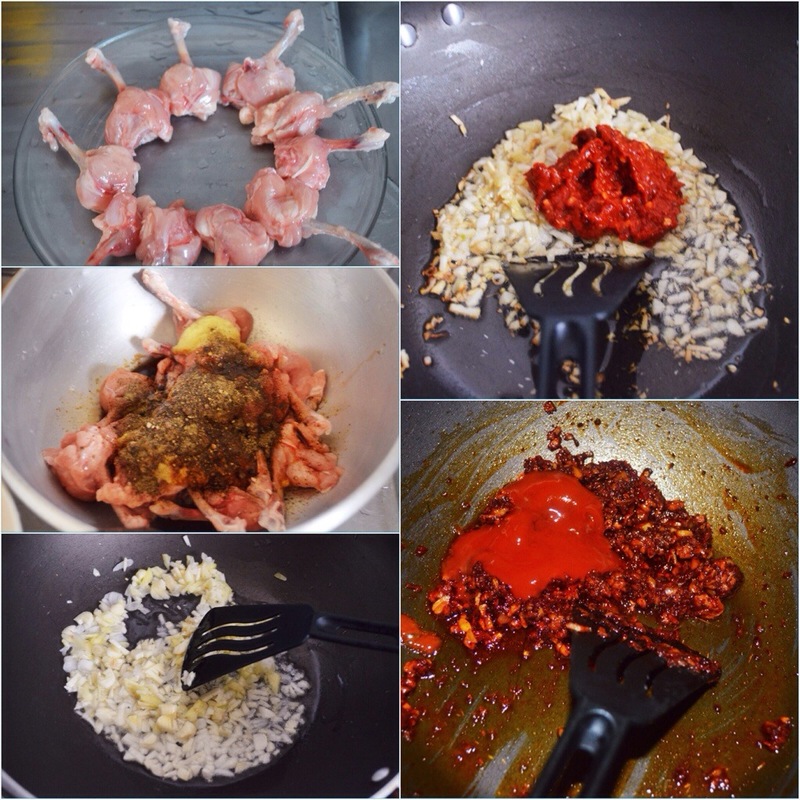 Yet the result is so scrumptious, flavorful and has a cool name like Chicken Lollipop. 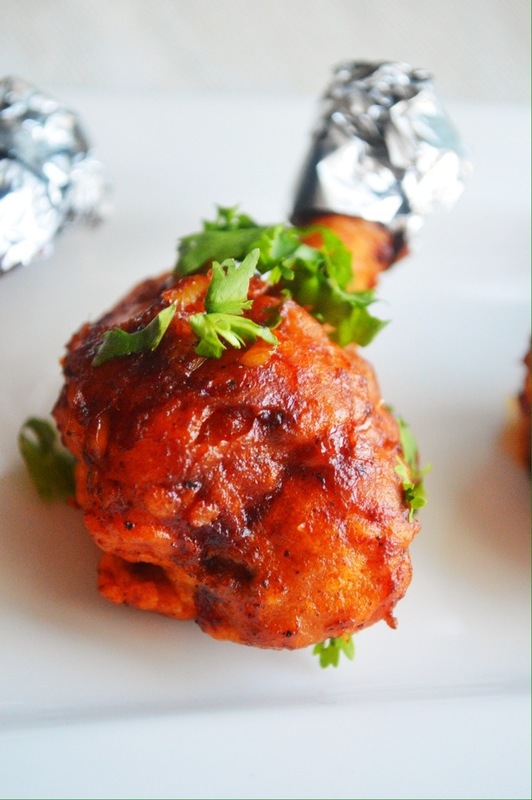 The basic idea of the chicken lollipop is to cut the meat around the base of the chicken wing drummette and pull it towards the top so it’s shaped like a lollipop. The great thing about it is the many ways that you can choose to prepare it. 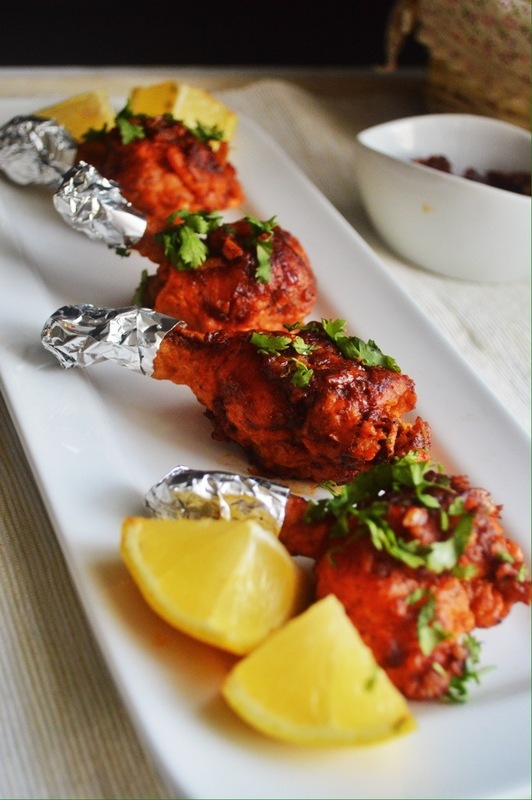 You can fry it with marination,bake it, mix it in sauce after frying, bread it, or even stuff it before frying. And the choices of dipping sauces are practically limitless. Lemme tell you, these lollipops are CRAZY good, I might just have to make these for all occasions, not just for any party. 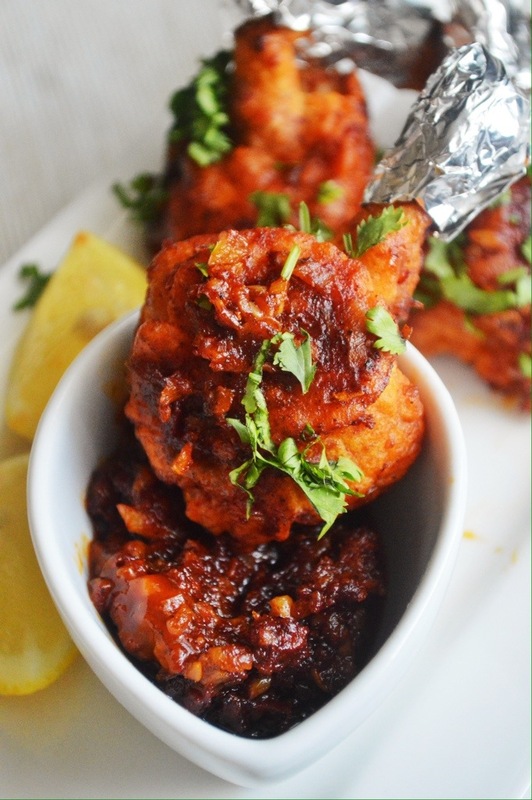 I’m sure I can find some appropriate moments that could include these delicious bites of juicy, spicy goodness. Enjoyy! 1.Heat up a non stick pan. When pan is hot add the oil. 2. Add in garlic and ginger. Saute very well till it is nice and brown till the rawness of the garlic is gone. 3. Add the red chilli paste. You can adjust the amount depending upon the level of spiciness you want. Sauté for sometime till the oil separates. Add in salt and pepper. Saute very well. 4. Add in soya sauce and chilly sauce. Till now you wouldn’t have got the saucy look to the sauce. So at this stage add few tablespoons of water till you get that perfect sauce like consistency. 5. Add sugar n vinegar. 1. In a bowl, whisk together all the ingredients from maida to salt. Add a few extra drops of water if the batter is very thick. 2. Add the chicken pieces and mix to coat well. Let it marinate, covered, in the fridge for 3-4 hours. 3. Heat oil on high heat, in a deep vessel. Reduce the heat to medium-high and add the chicken pieces, a few pieces at a time. 4. Fry for 3-4 mins turning the pieces occasionally. If you fry it further, the color of the coating will change from red to brown, if you used food color. 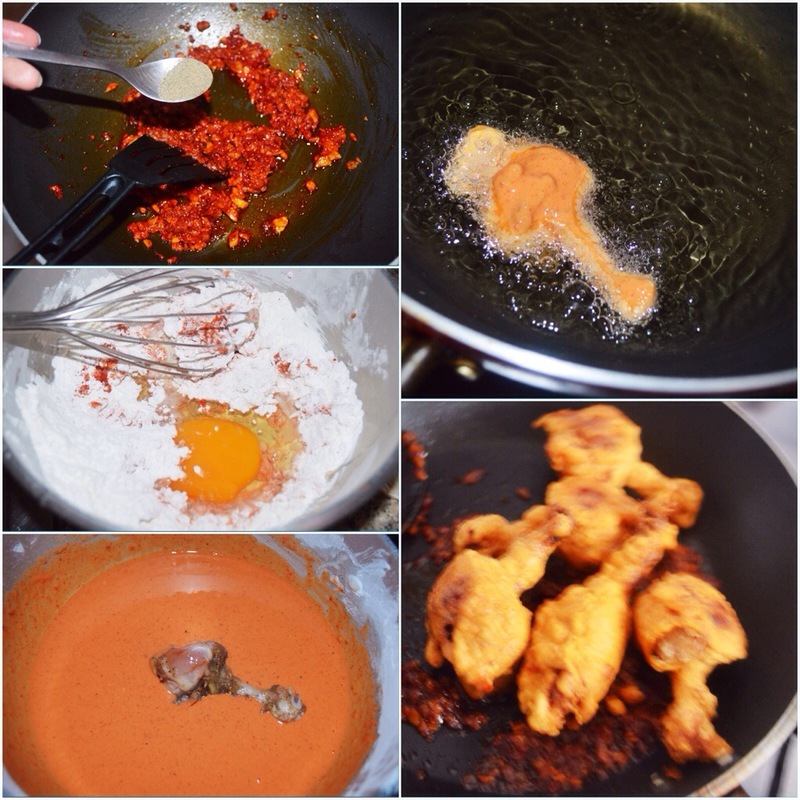 Finally mix the fried chicken pieces in the Schezwan sauce. Heat up a non stick pan. When pan is hot add the oil. Add in garlic and ginger. Saute very well till it is nice and brown till the rawness of the garlic is gone. Add the red chilli paste. You can adjust the amount depending upon the level of spiciness you want. Sauté for sometime till the oil separates. Add in salt and pepper. Saute very well. Add in soya sauce and chilly sauce. Till now you wouldn’t have got the saucy look to the sauce. So at this stage add few tablespoons of water till you get that perfect sauce like consistency. Add the chicken pieces and mix to coat well. Let it marinate, covered, in the fridge for 3-4 hours. Fry for 3-4 mins turning the pieces occasionally. If you fry it further, the color of the coating will change from red to brown, if you used food color. 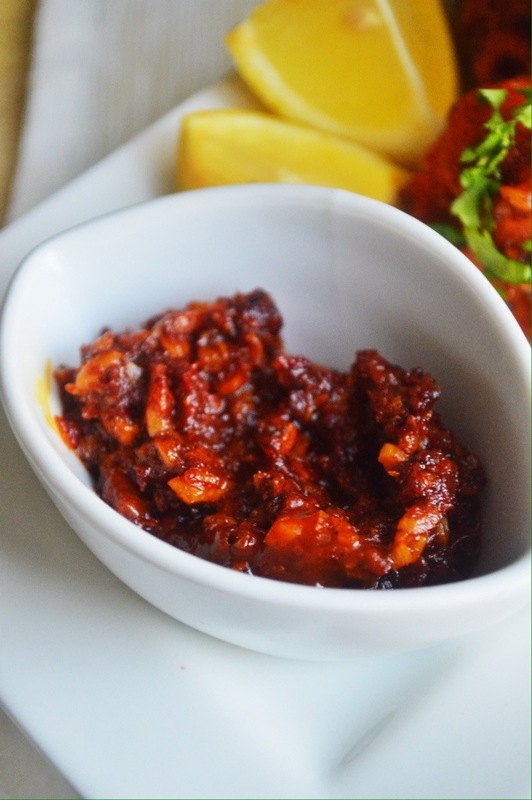 ✔️ To make red chilli paste, soak the dry red chillies in very hot water for an hour, remove the seeds and grind it to a fine paste in the mixer. This looks absolutely delicious! And that is saying something coming from a vegetarian like me! Heyy Angie!! I have been here only, been a bit busy and lazy lately. Hehe! But i am back. Hope i can post regularly from now on. I am sure i missed a lot during this time. Will have to catch up. oh babe, you are back with a bang. what a delicious dish; wish you would incite our taste buds much more often. What an amazing recipe to be back with! Looks great, Sadia!! 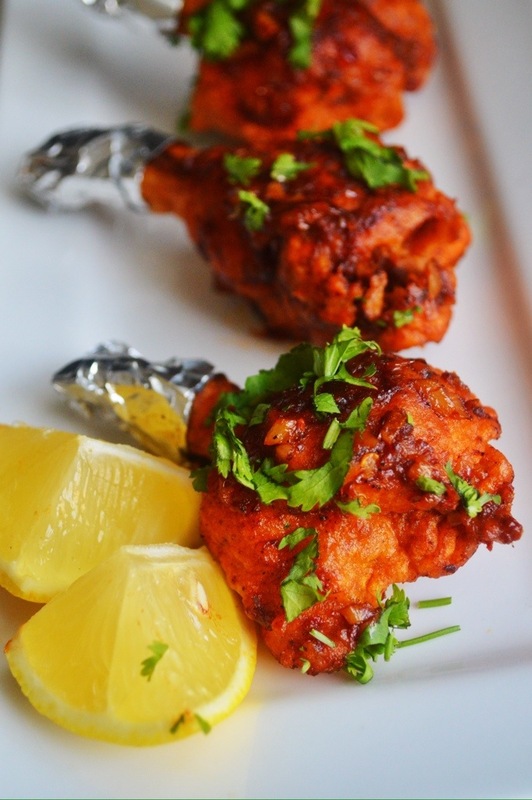 Welcome back, the chicken lollipops look delicious, spicy and a fantastic appetizer. Welcome back Sadia! 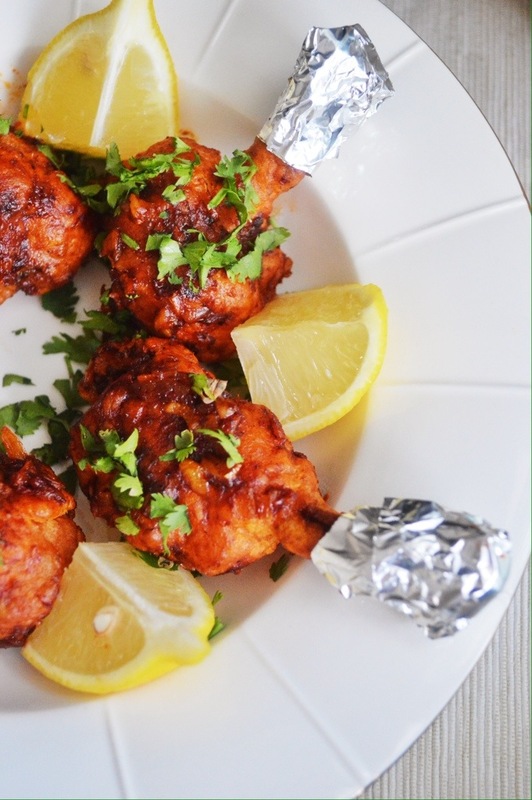 And wow, what a great recipe to return with to share- you’re right, these do look fantastic! Happy Ramadan to you! Thanks a lot Jess! 🙂 hope i can keep posting with enthusiasm. Welcome back Sadia! Of course we didn’t forget you! What a great recipe you’ve posted! So original and “good-looking”, thanks to be here again and keep on sharing your amazing recipes! Looks perfect and Ramadan Kareem Sadia to you and your family! Gorgeous, informative and fun. Not to mention impressive. Impressive both for the lollipop and the will power to fast. Welcome back and I know I missed you. Delicious. I would eat his for my main course! 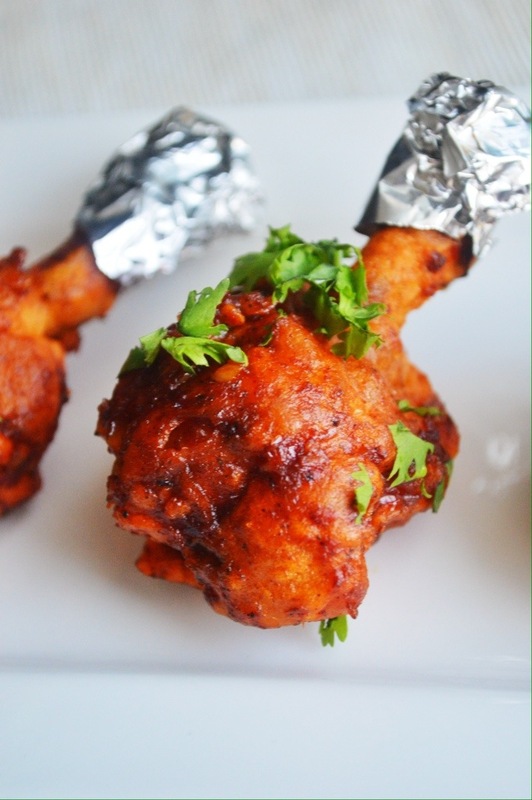 I love chicken lollipops, and these look absolutely amazing! Welcome back, Sadia and what a comeback! 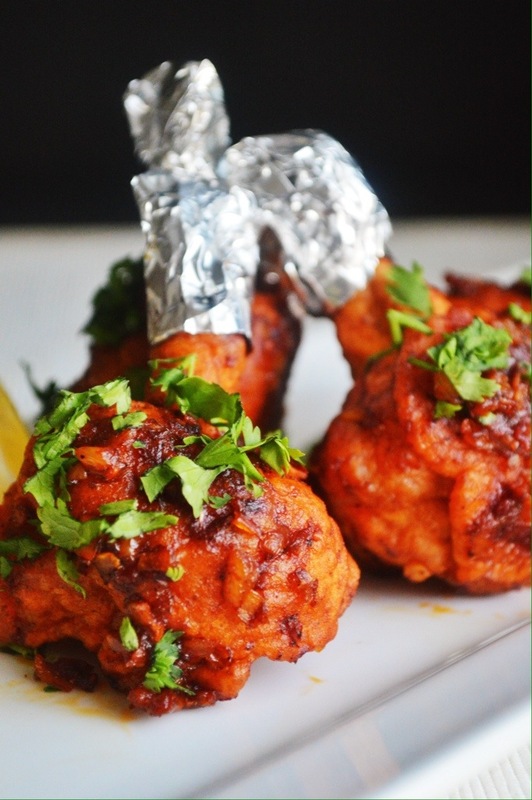 Those chicken lollipops define what fingerlicking good means. You have brought back memories- I used to love these as a child. Yum! Helloo Ania! Soo sorry dear for replying so late. For the lollipop recipe i didn’t use green chilly paste. I used red chilly paste. For that just soak the dried red chillies in very hot water, remove seeds and then grind it to a smooth paste. Did u marinate the chicken wings before mixing with the batter?? No dear, you can add all the ingredients listed under marination and then keep in fridge for 3-4 hrs. Then deep fry. What exactly is chillie paste? Because you also mention Chillie sauce..
Hey Farzana, I’m sorry for replying so late. The directions on how to prepare the chilli paste is mentioned in the notes.